1) What is a social enterprise? A social enterprise, generally speaking, is a business that targets at a specific social mission such as creating jobs and providing training to underprivileged groups, giving support to ethnic communities, promoting fair trade and building a community of harmony. It attempts to solve social problems by commercial means. Its profit will be principally re-invested in the business to create wider social impact. Maximising profit for the shareholders is not its primary target. In Hong Kong, there is no formal definition of social enterprise. Neither is there any formal registration system for social enterprises, nor is there any legal form as social enterprise in Hong Kong. Usually we use ‘Double Bottom Line’ to describe the unique of social enterprise which embodies a relationship between ‘social objective’ and ‘financial goal’ as a self-sustaining cycle of interaction. Unlike ordinary social service agency, social enterprise has a clear business target to reach in order to maintain and sustain its operation. Yet, unlike an ordinary business enterprise, social enterprise is primarily driven by its social objective. In other words, both the ‘social objective’ and the ‘business target” are indispensable components of social enterprise. 2)	How many social enterprises are there in Hong Kong? According to “Social Enterprise Directory” composed and issued by Social Enterprise Business Centre, the number of social enterprises established by non-profit organizations, NGOs and private enterprises, is 654, as of end of 2017. 3)	How did social enterprises come into existence? The phrase "social enterprise" first came into existence in the United Kingdom in the late-1970s, and since then, social enterprises have come a long way. The Hong Kong government has been constantly advocating for cross-sector cooperation, and has also established numerous funds to encourage various sectors to care for our community by means of social innovation and entrepreneurship. In terms of social entrepreneurship and social innovation education, the Commission on Poverty sponsored the first inter-collegiate Hong Kong Social Enterprise Challenge (HKSEC) in 2007 to cultivate and nurture potential social enterprises. The Home Affairs Bureau, which has succeeded in funded HKSEC since 2008, has also used various channels and methods to actively promote the development of social entrepreneurship. 1) What are the differences between SEs and charitable organizations? Social enterprise should be self-financing. The major income source should be generated by selling goods and services, and that differentiates it from traditional non-profit organisations or charitable organisations which are mainly supported by donation and sponsorship. 2) Social enterprise is non-profit making? Same as other enterprises, social enterprise is self-financing, however, profit-making is not the sole objective of a SE, which will set certain limits on profit distribution to shareholders, to allocate more resources to maximizing its social impact. 3)	What’s the difference between a social enterprise and corporate social responsibility? The primary objective of a social enterprise is to maximize its social impact, as well as maintain its financial sustainability; while an ethical business, usually in terms of corporate social responsibility (CSR) aspect, doing business in ethical way is an attempt to minimize negative impact on society or such initiatives are somehow driven by financial goal. 4)	How can I recognise the social enterprises in Hong Kong? There is no legal definition of and registration system for social enterprise in Hong Kong. However, public can look for information on social enterprises through numerous channels. 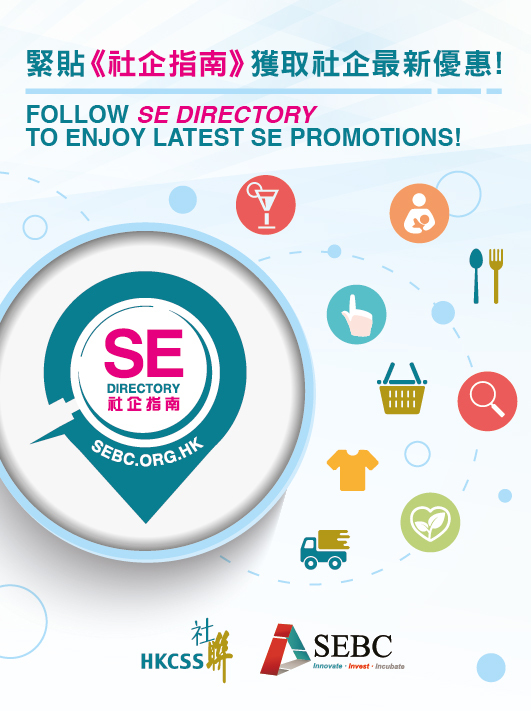 Social Enterprise Business Centre (SEBC) compiles and publishes the “Social Enterprise Directory’ every year since 2007. The directory as well as its derivatives mobile application (App) and on-line search engine enable public access to social enterprise information in Hong Kong. The Directory is supported and recognised by the Government. It serves as an important reference material for advocating responsible consumption across Government departments, public organisations, corporations and schools (企業及院校). Other channels include “SEE Mark” introduced by the Hong Kong General Chamber of Social Enterprises, featured on-line platform “SE Gallery” powered by ET Net under Hong Kong Economic Times, “SE Award Scheme” organised by Home Affairs Bureau and Social Enterprise Advisory Committee, the Enhancing Self-Reliance Through District Partnership Programme (ESR Programme) by Home Affairs Department and “Enhancing Employment of People with Disabilities through Small Enterprise” Project by Social Welfare Department, etc. 1)	Am I qualified to set up a social enterprise in Hong Kong? Generally speaking, everyone can open a social enterprise in Hong Kong. 2)	Social enterprise is non-profit making? Same as other enterprises, social enterprise is self-financing. However, profit-making is not the sole objective of a social enterprise, which will set certain conditions on profit distribution to shareholders. The rest of the profit is reinvested for further business development for greater social impact. 3)	What’s the difference between a social enterprise and Corporate Social Responsibility (CSR)? The primary objective of a social enterprise is to maximise its social impact, as well as maintain its financial sustainability; while an ordinary enterprise, usually in terms of CSR aspect, is an attempt to minimise negative impact on society or its social responsibility initiatives are somehow driven by profit maximisation. 4)	Do social enterprises pay rent? Same as ordinary enterprise, operating expenses such as rental, utilities expense and salaries are the operation cost of a social enterprise. If a social enterprise receives an in-kind support (e.g. venue sponsorship), it should be reflected on the financial record. 5) Is social enterprise allowed to distribute bonus? Yes, but for good corporate governance, this must be approved by the Board of Directors of the social enterprise. 6)	Will social enterprise go bankrupt / liquidate? If a social enterprise closes down, it has to deal with the bankruptcy or liquidation problem, be it a limited company or an unlimited one. 7)	Does social enterprise need to pay tax? Social enterprise is obligated to pay tax unless it is recognised as a charitable institution or trust of a public character under section 88 of the Inland Revenue Ordinance (Cap. 112). 8)	Can social enterprise receive donations? Social enterprise can receive donation or sponsorship. However, social enterprise is a self-financing business and it should rely on income generated by selling goods and services rather than through grants and donations. 4. How to set up a social enterprise? You may now be at different stages in the process of preparing to set up a social enterprise. Some of you may still be identifying a social problem to focus on while some couldn’t wait to register it as a company and to raise capital. Wherever you are, we suggest you to slow down a bit and examine your plan against the five-stage framework below to see if there is anything you can make further improvement. Although responding to social issue is the core of social enterprise, what is often ignored by most social entrepreneurs is precisely this core function. Many founders of newly established social enterprises start with business model and plan rather than understanding the social problem. They usually spend much time on market researches, while seldom pay attention to understanding what the community or the people really need. A social enterprise would be no different from an ordinary enterprise if it is not built on a thorough understanding of the concerned social issue and need. A perfect business plan will be meaningless if it lacks a soul - the social value itself. Therefore, the first, and indeed the most important step is to understand the needs / problems as well as the potentials of the community. There are many incubation platforms in Hong Kong that provide advisory services for newly established social enterprises. But don’t forget that you are the founder of your social enterprise and you should be its most informed incubator. Nothing can be achieved if you do not even have an initial idea to base your social enterprise on. At this stage, you are supposed to devise your business model, understand the market needs, build your team, as well as the organisational structure of your social enterprise. To be able to accomplish all these, you should equip yourself by taking part in training programmes, workshops and business clinics. Everyone is talking about innovation, but what is “innovation”? Is having something original and new a must to make a good social enterprise? In fact, many are mistaking innovation for invention. Social enterprises do not have to create brand new groundbreaking products, services or plans. “Innovation” is about approaching old issues with new models and solutions. It will be great if a social enterprise does invent something, but innovation is more a means than an end itself. Please bear this in mind. Little can be done without capital even if we have got a terrific plan. You are suggested to consider applying for grant from the seed money programme launched by the Government in recent years. Some funding programmes were once for non-profit organisations only, but they are now open to other entities including private companies. Apart from this, there are some venture capital funds targeting at the highly competitive social enterprises with big social impact. They either directly invest in them or provide loans to them. As in an old Chinese saying: a real genius does not worry about whether there will be a scout. How should the social value of a social enterprise be gauged? It is a problem that worries many social entrepreneurs. For a social enterprise at an embryonic stage, it is not easy to assess its social impact due to lack of data. Don’t be overwhelmed by this problem. It is already commendable that you have seriously thought about this at this start up stage. There are many tools available to assess social impacts. There are also workshops providing you with training on knowledge and skills in social impact assessment. What you need to do at this stage is to go check them out. For details please refer to SE Good Start – A Practical Guide of setting up a Social enterprise. In the context of forming a social enterprise, two types are more relevant – private company limited by shares (simply referred to as “company limited by shares” in this Guide) and company limited by guarantee. In accordance with the Companies Ordinance (Cap.622), all individuals (aged 18 or above) and groups may set up companies for lawful purposes. The Companies Registry administers and enforces most parts of the Companies Ordinance. The constitutional document that a company must have upon its incorporation is the AA. Companies formed before the current Companies Ordinance (Cap.622) in force on 3 March 2014 would also have the Memorandum of Association, which was abolished by the current Ordinance.All information such as the object clause (if any) contained immediately before the Memorandum of Association was abolished shall automatically form part of the AA. Under the current Companies Ordinance, a company may adopt as its AA any or all of the provisions of the Model Articles prescribed for the type of the company to which it belongs. In other words, the founding members may save much trouble and costs in drafting the company’s AA upon incorporation. The Model Articles could be found in the Companies (Model Articles) Notice (Cap.622H of the Laws of Hong Kong). Every company must have at least one member, in the case of a company limited by shares, its members are commonly called “shareholders”. Companies may have different classes of members, for example, voting members and non-voting members. In general, for a company limited by guarantee, each member of the same class would have the same voting power, i.e. one vote per member. For a company limited by shares, a shareholder’s voting power is in proportion to the number of shares that he holds, normally one vote per share. For a company limited by guarantee, it must have at least 2 directors who must be natural persons aged 18 or above. For a company limited by shares, it must have at least 1 director; directors of a company limited by shares may be natural persons or body corporates provided that it must have one director who is a natural person. Every company must also have a company secretary, who must be either a natural person ordinarily resides in Hong Kong or a body corporate that has its registered office or place of business in Hong Kong. A limited company, as opposed to an unlimited company, means the liability of the members of the limited company for the debts of the company is limited either by shares or by guarantee. In other words, the members will not be held liable for the limited company’s debts as long as those members have fulfilled their commitment to pay for their shares (in case of a company limited by shares) or to contribute the amount stated in the AA. Company limited by guarantee - The liability of its members is limited by the company’s AA to the fixed amount that the members undertakeand members must contribute to the assets of the company in the event of the winding up of the company. In Hong Kong, social enterprises choose to be formed as a company limited by guarantee mainly because this is a legal form that is eligible to apply for Tax Exemption. Some social enterprises are formed as a company limited by guarantee and operate as the subsidiary of its mother organisation. In these cases, the social enterprises are governed by an independent board of directors. Company limited by shares - The liability of its members is limited to any amount unpaid on the shares held by the members. For example, Mr. Chan subscribes for one share of the company at a consideration of HK$100. He has paid for HK$70 when the share is issued to him. The company can subsequently call on Mr. Chan to pay the balance of HK$30. Once Mr. Chan has paid the said HK$30, he has no liability towards the company in paying its debts even if the company is unable to pay its debts in full. This legal form is suitable for social enterprises which are desirous to have the flexibility to attract new investors after incorporation because a company limited by shares may, subject to its AA, raise fund by issuing new shares at any time to incoming investors. “Sole Proprietorship” refers to a business that is owned by one individual. Strictly speaking, it is not a legal entity, though the proprietor may engage employees. The proprietor is entitled to all of the profits and is responsible for any debts that the sole proprietorship incurs. In substance, the sole owner has unlimited liability for the debts of his sole proprietorship business, making this legal form an uncommon and unattractive one for social enterprises. According to Partnership Ordinance (Cap.38 of the Laws of Hong Kong), partnership is the relation which subsists between persons carrying on a business in common with a view of profit. Persons who have entered partnership with one another are called collectively a firm. Every partner in a firm is liable jointly with the other partners for all debts and obligations of the firm incurred while he is a partner. Since the extent of liability borne by the partners is unlimited, this legal form is uncommon for setting up a social enterprise. For detailed information and practice, please refer to "SE Good Start – Choosing a Legal Form and Recommended Practices"
6. Do I need to hire for accountancy or legal service in company registration? Accounting and law firms in general can help their clients to finish the registration for limited companies. They can help to prepare the company’s articles, registration documents and even company stamps. Apart from accounting and law firms, companies providing secretarial services can also assist you in finishing the tasks; nevertheless, if you expect that your business needs plenty of legal opinions, you are suggested to look for help from a law firm. Moreover, before registering as a partnership firm, partners may have to set up a contract. Some people may hire a solicitor to draft the contract to ensure that nothing important is left out. The cost of doing so depends on how complicated the contract is. 8. Where can I get advice and support on starting up a social enterprise?